« Poll: How Do You Deal With a Non-responsive Traffic Signal? 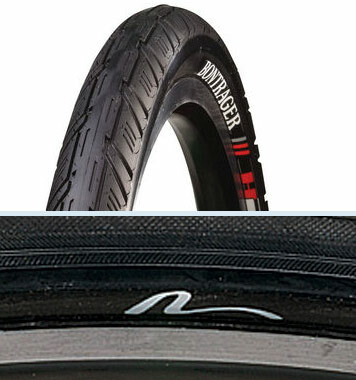 Bontrager tires mount with ease, while some Nashbar tires can be a hassle to mount by hand. When it comes to tires, besides quality manufacturing, I look for ease of mounting: that means using hands only. Yesterday I put two new tires on identical rims and found that one went on easily — Bontrager — and one was a bear to force on by hand — Nashbar. I’m not surprised. I find myself pinching tubes when I use a tire iron, so I look for tires that go on easily, which they should. Air pressure keeps a tire on the rim, not how tightly it fits. Now there is a certain skill to making a tire just the right diameter and you can be sure the people who really care about this make sure they get it right. Bontrager gets it. Everybody screws up, including Continental, an otherwise great tire maker. I’ll never forget a cheap Continental I bought about five years ago, made in Thailand. It was the hardest tire to put on I’ve ever come across. I cursed that tire up and down every time I flatted! The Nashbar is an economy model. I don’t need something fancy. I just wish tire companies would take the time to test-mount tires before selling them. Before I get off my saddle sore, there’s one other item about tires that bears inspection. The bike industry would be doing consumers a big favor by making tires at actual widths, not nominal widths. If a tire sidewall says 700 x 28, make sure it has a 28-mm cross-section, not 25 mm. Follow up: I have been told, and can now confirm through personal experience, that the rim plays a role in tire fit. The Nashbar tire fits easily onto a Mavic Open Pro 700c rim. I suspect this is because the rim is deeper than the Mavic MA2. I still contend that tire/rim combinations should be tested and rated for fit so the consumer can know what fits best. It’s not an impossible task. This entry was posted on September 2, 2011 at 6:16 pm and is filed under Products. You can follow any responses to this entry through the RSS 2.0 feed. You can leave a response, or trackback from your own site. Great post. When buying new tires, the primary quality I want is ease of mounting by hand. Its frustrating that there is no way to know this about a tire until you bring it home and actually wrestle it onto the rim. I also noticed that the Bontrager tires I have go on easier than the Continentals I just got. Given your similar information, I think I may be sticking with Bontrager exclusively from now on. The world champion tire for hard-to-get-on is the Schwalbe Marathon. Good thing flats are rare with it, because on a good day I can get one on in half an hour, using three tire levers and two toestraps. Agreed on all counts! Another really tough one is Vittoria Randonneur Cross… The tire that made me buy the Tire Bead Jack. This is an invaluable tool for mounting tough tires, but it’s a bit large to carry with you, so you’re still going to be in trouble if you get a flat out on the road. If you have to mount a tight tire, the Michelin levers are the best–been using them over 25 years. Can be hard to find at times (they never break, but I lose them) I had to order from a European supplier last time. BTW Michelin tires are always a bear to mount, so I avoid them.